This weekend was tiring and exciting all in one. On Saturday morning, bright & early, we woke up grabbed some Sonic breakfast and headed to get our 25' U-Haul Truck. That thing was massive! We moved all day Saturday in the heat, and we have to thank some of our friends and family for helping! Mom & Dad, Melissa & Michael, Sandra, Chris, & Trav, thank you all for your time and help getting us moved in! We cannot thank you enough! So when all was said & done, we had a half broken entertainment center in our living room, a few of us watched as Eric desperately tried to get it put back together & when he was done the poor thing was slouching to one side! All of us were laughing so hard and that poor old piece of furniture! So, Sandra & I headed out and got an adorable new tv stand for the living room. LOVE it! Sunday night we actually celebrated Father's Day and took Eric to Rudy's for dinner. Bella was a little "plugged" up and during the entire time we sat there eating dinner, she kept grunting and saying "Poo!!" It was embarrassing and sad to say the least. But when we got home, she went potty and was okay. I have found something that magically gets my family on the couch together for at least 10 minutes... Popcorn!! Eric, Bella, & I love it and whenever I make some, they come running! So we had that before Bella went to bed, and then Eric & I watched "He's Just Not That Into You" and it was cute! We took Monday off, and did some more furniture shopping, and ended up ordering a dining room table. We're planning on having Christmas at our house this year with Eric's family, so it will be much needed! Now I just have to figure out how to make a turkey by December! ;) Last night we all went to Logan's Roadhouse to celebrate Father's Day, and Bella did wonderful, thanks to her Uncle Mark. Mucho Appreciated! 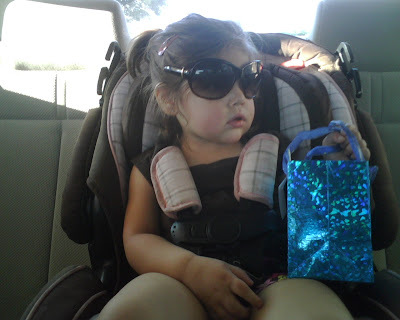 Here's a picture of Bella from last night wearing my sunglasses! Too precious! !